Massive aggressive wildfires have ravaged Greece, killing at least 74 people, destroying seaside resorts and sending people fleeing into the ocean. Cars and buildings were torched in the worst blaze the country has seen in at least a decade. This is likely the new normal on a planet that is steadily heating up, creating dry and flammable conditions. And it’s not just common sense that tells us the increase in wildfires is due to climate change. Scientific studies have shown the same. 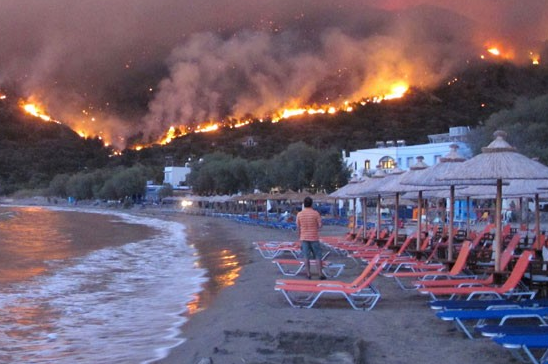 However, out of numerous mainstream (corporate) media reports on the destructive fires in Greece, I haven’t seen any that mention climate change or global warming. CBS didn’t mention it. Reuters avoided the obvious conclusion. BBC kept clear of the words “climate change” and “global warming” despite linking to a separate article on the “global heatwave.” Of course the Washington Post wanted nothing to do with it. And the corporate propaganda outlet The New York Times couldn’t find the key words either. 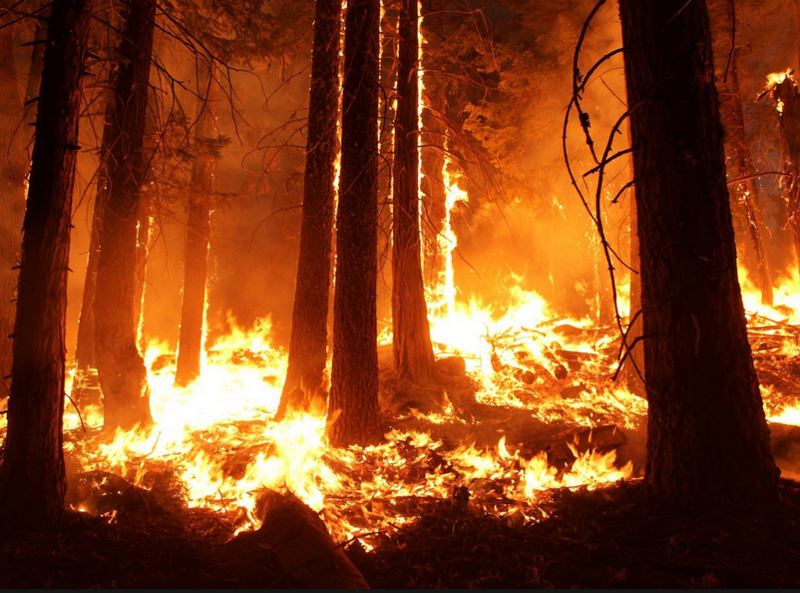 There are many other ways the heating up of our planet is destroying our ability to survive, but extreme fires are perhaps the most obvious. If there’s ONE TIME the corporate media should mention that we are boiling ourselves and eliminating a future on this planet, it should be when grand historic cities like Athens, Greece are literally on fire. As we all walk off this proverbial cliff, don’t expect CNN or Fox News or even The New York Times to tell you anything about it. The death toll from floods and landslides triggered by tropical storm Son Tinh rose to 27 on Tuesday, and seven people are still missing, the government’s Disaster Management Authority said. Though tropical storm Son Tinh weakened to a tropical depression by the time it reached Vietnam last week, the torrential rains it brought caused heavy flooding and landslides in many parts of northern Vietnam. Some areas in the outskirts of the capital Hanoi remain submerged. 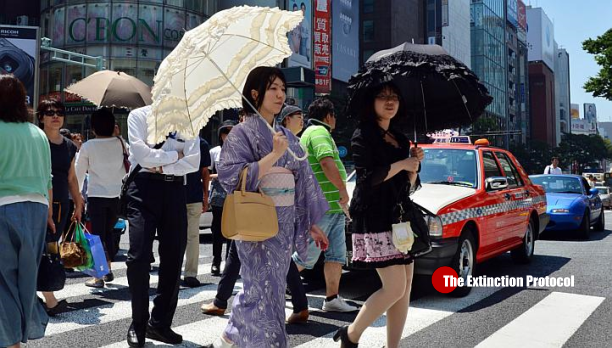 An “unprecedented” heatwave in Japan has killed at least 65 people in one week, government officials said Tuesday, with the weather agency now classifying the record-breaking weather as a “natural disaster”. 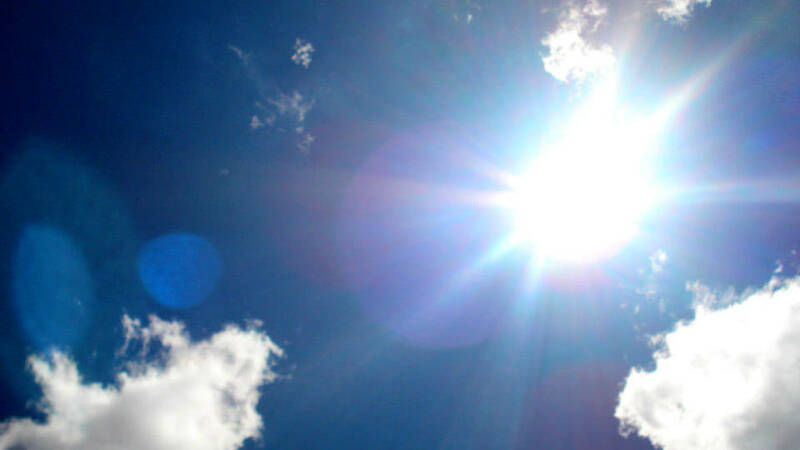 In the week to Sunday at least 65 people died of heatstroke while 22,647 people were hospitalised, the Fire and Disaster Management Agency said in a statement. Both figures are “the worst-ever for any week during summer” since the agency began recording fatalities resulting from heatstroke in July 2008, an agency spokesman said. In Sweden and Latvia, and further south in Greece, wildfires are spreading amid a brutal heat wave. It’s so hot, even parts of the Arctic are on fire. 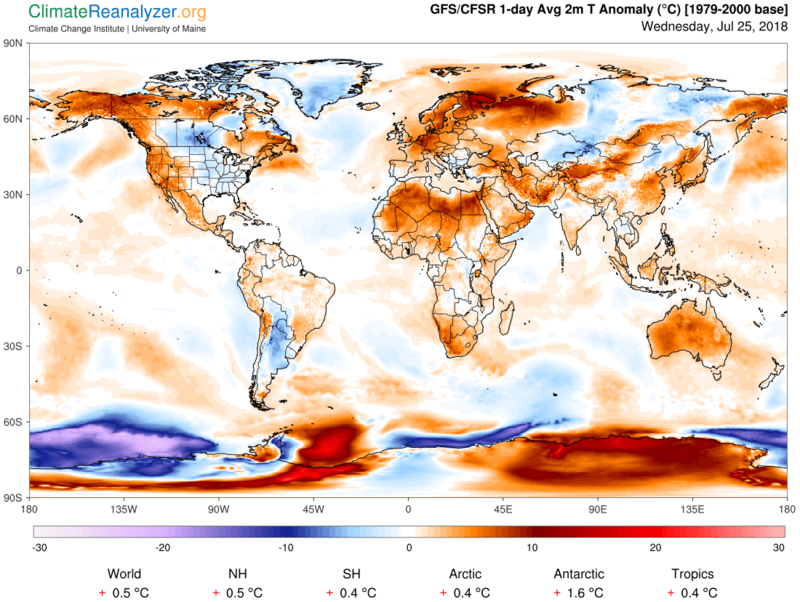 Temperatures this month reached 86 degrees Fahrenheit well inside the Arctic Circle in Sweden, where the worst fires the country has seen in decades are now burning. More than 50 fires have ignited across the country, forcing evacuations. Finland and Norway are also fighting flames. “This is a serious situation and the risk for forest fires is extremely high in the whole country,” Jakob Wernerman, operative head of the Swedish Civil Contingencies Agency, told the Associated Press. Because it's 2018, the B.C. government has had to issue a warning asking residents and tourists not to fly drones near wildfires, more than half a dozen of which are actively burning across southern British Columbia today (July 23). "BC Wildfire Service staff were forced to temporarily halt air operations on the Wilson Creek wildfire on Sunday, July 22, 2018, due to people operating unmanned aerial vehicles (UAVs, or 'drones') above the fire," reads a statement issued by the B.C. ministry of forests, lands, natural resource operations and rural development. "A helicopter that was supporting ground crews was grounded," it continues. 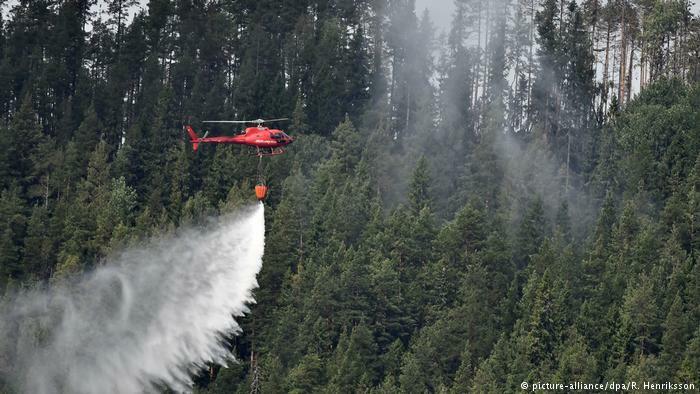 "Additional firefighting aircraft working on other fires in the area had to be diverted from their flight paths to avoid the airspace around Little Wilson Lake area, which is about 19 kilometres east of Nakusp." It’s forecast to remain hot across the Interior through mid-week. 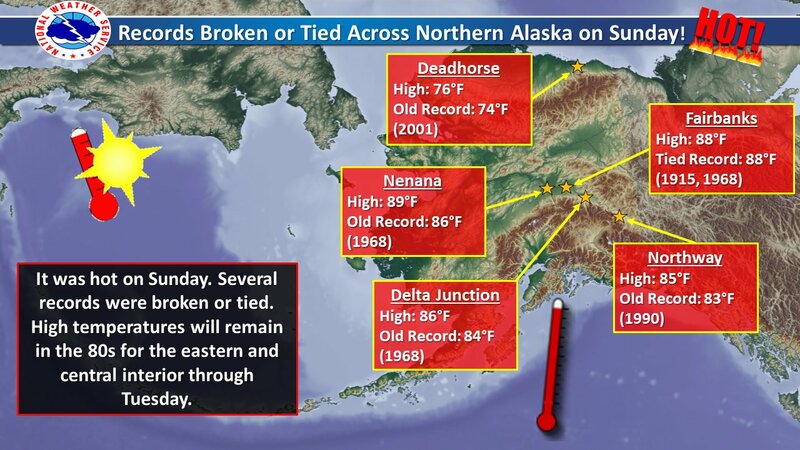 National Weather Service meteorologist Erin Billings says several temperature records were broken or matched on Sunday. Billings says high pressure over the region is expected to persist through Wednesday, with 80 plus degree highs. The weekend deluge was only the beginning. Several more onslaughts of heavy rain are expected in the East this week, especially in the mid-Atlantic region, leading to "potentially dangerous, even life-threatening flooding," the National Weather Service warned. Flood watches and warnings have been posted from Pennsylvania to North Carolina. At least 10 million people are under flood watches or warnings. Additional rainfall totals of 5-10 inches are possible somewhere in the central Appalachian Mountains to the coasts of the mid-Atlantic and North Carolina, AccuWeather meteorologist Kristina Pydynowski said. It’s going to be hot and humid in south Louisiana, and it’s going to last all weekend. A combination of hot temperatures and high humidity will cause temperatures to feel like 108 to 110 degrees during the hottest part of the day on Friday, especially to the west of Interstate 55, causing the National Weather Service to issue a heat advisory. The official Central Texas temperature soared to 114 degrees at around 5 p.m. Monday at Waco Regional Airport, topping the previous all-time high temperature of 112 degrees set on Aug. 11, 1969. 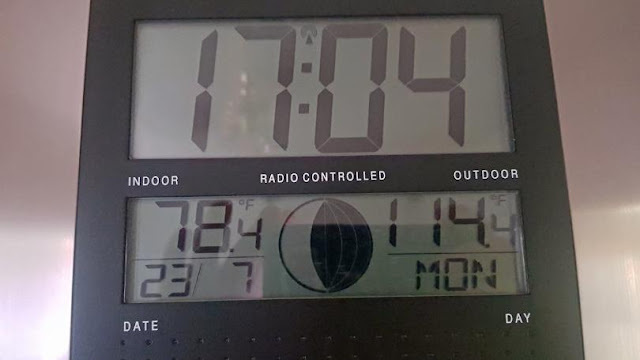 That also beat the record high of 107 for the date. In Burnet, the mercury rose to 110 degrees, matching an all-time high set on Aug. 28, 2011. Yosemite Valley will shut down Wednesday as fire crews try to stop the Ferguson Fire from spreading into the national park, according to fire crews. A noon closure will be imposed on a portion of Highway 41 from Wawona to the tunnel entry into Yosemite Valley, according to Yosemite National Park Superintendent Michael Reynolds. The closure is expected to last until Sunday. “Get yourself out of here if you can,” Reynolds told a group of evacuees, tourists and park employees inside the Yosemite Valley Auditorium on Tuesday morning. Volunteers and government officials are scrambling to protect wild horses in the American West, where the animals are facing harsh drought conditions that have already led to dozens of deaths. In a stretch of land that includes parts of Arizona, Utah, Colorado, Nevada, and New Mexico, land managers are rushing to help the horses survive through the dry conditions that have reached an intensity in some areas that have not been seen for decades, if not centuries. “It has never been this bad,” Simone Netherlands, the president of Arizona-based Salt River Wild Horse Management Group, told The Independent. Florida’s governor declares a state of emergency in seven counties because of toxic algae blooms. From flash drought to flash flood, this July is a story of weather extremes in Washington. A week ago, no measurable rainfall had fallen in Washington during July, a record 16-day dry spell so deep into the month. One week later, the heavens have unloaded more than eight inches of water on the city, and it is one of the wettest Julys on record. Some of the heaviest rain is probably still to fall. A water hose in the sky, known as an atmospheric river, will blast the Mid-Atlantic, including the D.C.-Baltimore urban corridor, for the next 48 to 72 hours. An additional three to five inches or more of rain may come down, which, if it materializes, would make this the wettest July on record in Washington. Problematically, the ground is saturated and rivers and streams are swollen, so they cannot take on much more water before flooding occurs. “A potentially dangerous, even life threatening, situation is setting up for much of the Mid-Atlantic,” the National Weather Service Middle Atlantic River Forecast Center tweeted. Last weekend, residents of Los Angeles and other areas of coastal California could be forgiven for thinking they had overslept like Rip van Winkle and woken up in the heat of September or, over the last few days, that they had suddenly been transported to humid Miami. The disorienting weather has been the result of a combination of an unusually early, record-setting heat wave, monsoon conditions over the Southwest and the mountainous local topography. The heat has taxed the electrical grid, leaving thousands without power; endangered human health; and kicked off a flurry of wildfire activity. “It’s been quite the week,” says Daniel Swain, an atmospheric scientist at the University of California, Los Angeles. Rising temperatures are linked to increasing rates of suicide, according to a large new study. The researchers warn that the impact of climate change on suicides may be as significant as economic recessions, which are known to increase rates of self-harm. The links between mental health and global warming have not been widely researched but the new work analysed temperature and suicides across the US and Mexico in recent decades. It found that the rate of suicide rose by 0.7% in the US and by 2.1% in Mexico when the average monthly temperature rose by 1C. 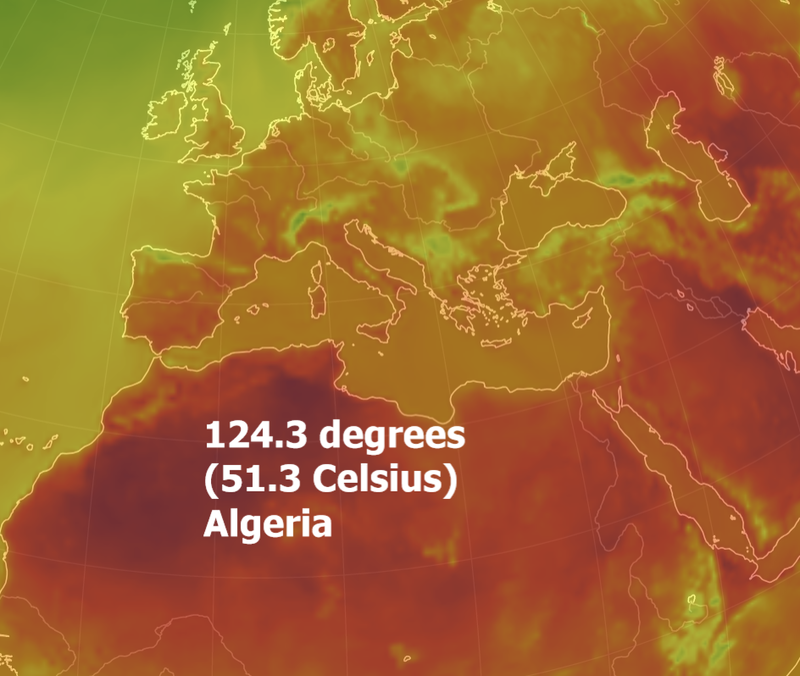 Its 124.3-degree temperature surpassed Africa's previous highest reliable temperature measurement of 123.3 degrees (50.7 Celsius) set July 13, 1961, in Morocco. According to the Guinness book of records, on 13 September 2012, the World Meteorological Organisation disqualified the record for the highest recorded temperature, exactly 90 years after it had been established at El Azizia, Libya, with a measurement of 58°C. The official highest recorded temperature is now 56.7°C (134°F), which was measured on 10 July 1913 at Greenland Ranch, Death Valley, California, USA. As a result of an investigation in 2012, the WMO concluded that the El Azizia record measurement could be inaccurate by as much as 7°C due to a combination of factors including the asphalt-like surface over which the measurement was taken, which is not a fair representation of the native desert soil. A drought that’s hit wheat crops across the Black Sea region and Europe has forced Egypt, the top buyer of the crop, to pay the highest price in more than three years. Egypt’s General Authority for Supply Commodities paid $235.65 a metric ton, according to traders familiar with the process and data compiled by Bloomberg. The government purchased a total of 420,000 tons of wheat for Sept. 1-10 delivery, said the people, who asked not to be identified because the information is confidential. Benchmark futures traded in Chicago have surged 20 percent this year and Paris wheat for December delivery hit a record for the contract on Tuesday. Dry weather means Russian production will fall for the first time in six years. Crops in France, Germany and the Baltic countries are also expected to be smaller. BRITAIN is on the brink of its hottest summer in 400 YEARS with the savage hot weather engulfing the UK set to last MONTHS. The Met Office warned the “remarkable” temperatures across the UK are on course to last until at least late August with “very warm, hot or very hot” conditions likely for at least another five weeks. It means Britain is officially on course for its hottest summer ever, with the record-breaking temperatures of 1976 - which is believed to be the hottest since at least the early 1600s - now very seriously under threat. Half-way through this meteorological summer, the daily maximum temperature is 20.9C, while the hottest complete summer on record saw an average daily maximum of 21C. In 1976 the Central England Temperature (CET) between June and August averaged 17.8C. According to the Met Office, the average maximum temperature was 20.96C - with both figures now severely under threat if the hot weather continues, as forecasters expect. 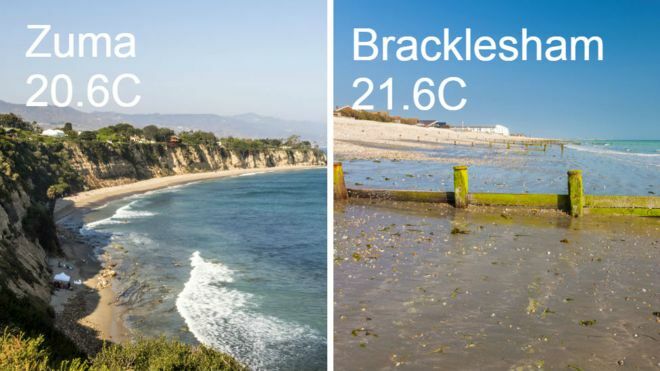 The heatwave is raising sea temperatures in parts of England to higher than some of those in California, according to statistics. Bracklesham Bay in West Sussex, where temperatures have hit 21.6C, is beating temperatures in Zuma Beach, at 20.6C. UK temperatures are overall way higher than the average for the time of year. Figures from the Channel Coast Observatory (CCO) also show that Skegness and Morecambe have been a few degrees warmer than Cornwall. Forecasts are predicting that the summer heatwave is set to continue in many parts of the UK, which seems too good to believe after the country has already enjoyed such a sustained period of sunshine and warmth. The cause of the heatwave is down to the positioning of the jet stream and high pressure across the UK, leading to dry weather. But needless to say, the scorching conditions and lack of rain have had a big impact on the environment. We’ve already heard of wildfires starting, reservoirs drying up, hosepipe bans coming into effect, and even the collapse of a historic oak tree, named Agatha Christie Oak after the famous crime writer, in Torquay. Shoppers face a shortage of carrots early next year because the combination of the “Beast from the East” and the prolonged dry weather will cause the annual harvest to fall by about a third, farmers’ leaders are warning. Prices for carrots will rise and they may have to be imported from as far as Israel, the British Carrot Growers Association said. Extreme heat has made the job difficult for Latvian firefighters, as hundreds of hectares have been scorched in the west of the country. Meteorologists have said that unfavorable conditions will continue for two weeks. Five days of unabated fires have destroyed more than 800 hectares (2,000 acres) of land in western Latvia, authorities said Sunday. 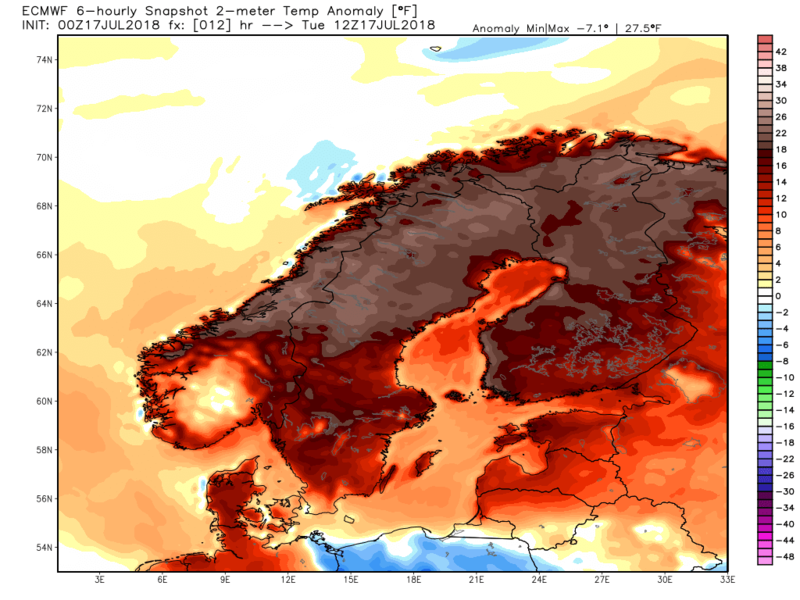 The Baltic nation is the latest to succumb to the heat and drought waves that have plagued northern Europe this summer. 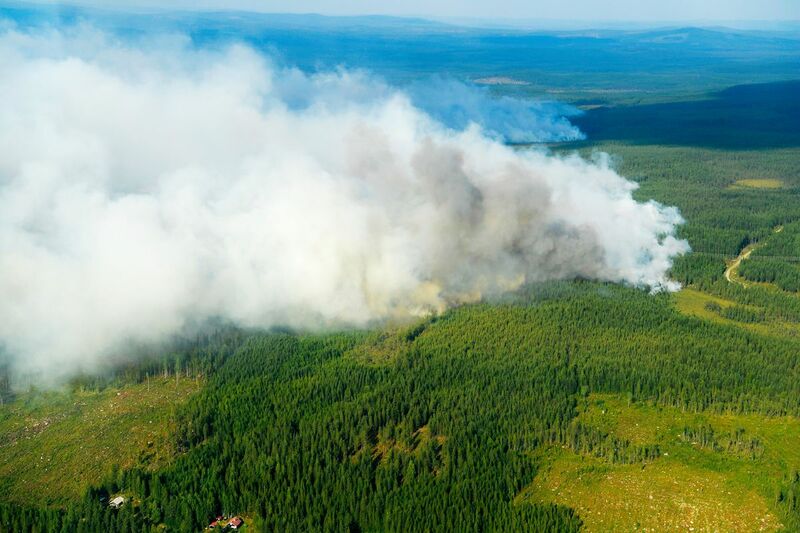 Across the Baltic Sea, Sweden too has grappled with wildfires (main picture above) that have led to evacuations and prompted the Nordic country to seek EU help with. 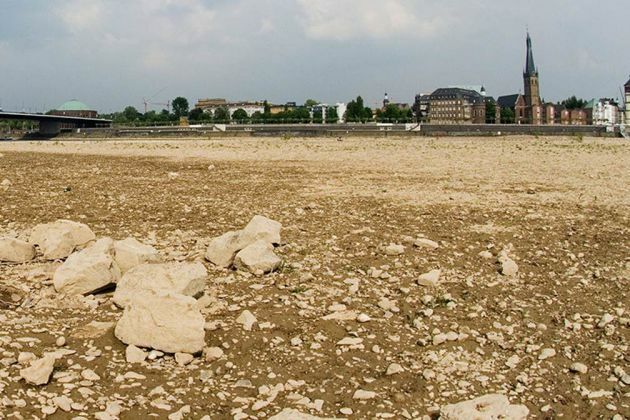 A drought and heat wave in Europe this summer could cause a shortage of potatoes big enough for industrial production of French fries, a German industry group warned on Tuesday.